The advancement and ubiquity of technology is providing health systems the option to rapidly migrate to tablet-based technology platforms, which increase patient engagement and deliver measurable return on investment. Pioneering healthcare administrators are turning to this solution to streamline time-consuming, repetitive tasks and replace registration paperwork with electronic mobile tablet systems that improve operational efficiencies. How does tablet and mobile technology for patient check-in drive improvements in operational efficiency and patient satisfaction? We’ve identified six major ways to categorize the return on investment. Eliminate Paper Forms and Automated Processing: Replacing paper forms using a tablet-based registration platform enables standardization across the organization. What was once left up to local staff is now repeatable across the health system. Standardized forms and technology platforms lower training and compliance costs and provides patients with the same efficient experience across the health system. Digital forms also have powerful advantages to paper for patient satisfaction. The forms are administered in multiple languages, in 508-compliant font sizes, and necessary forms are triggered and presented individually based on location of services (e.g., clinic), and financial classes, (e.g., Medicare and Tricare). For enterprise health systems registration forms and on-site labor costs have long been a component of overhead costs, and a cascade of operational inefficiencies for staff. These costs include the paper itself, as well as labor to order the paper, deliver, scan, review, file, and archive signed forms: the proverbial elephant in the waiting room. Patient Check-in platforms that include digital forms support the consumerization of patient engagement and enable personalized forms that pre-populate information and manage expirations for renewal, e.g. HIPAA forms. These systems are ideal for scheduled appointments but you should make sure your platform can also handle walk-in appointments with no previous EMR record as well as bedside registration for emergency rooms. Effective platforms allow staff to indicate a patient mode and tasks for completion so that consent and care can be expedited if necessary. Health systems can use 10 to 20 pages of forms per patient visit. Which means digitizing forms in a single medium size health facility can account for $40,000 of first year savings just on paper alone. If you consider the costs of toner, ink, pens, clipboards, scanners, printers, and storage/archival space and the value begins to rise. Hard costs are easy back-of-the-envelope calculations. But what about labor? Let’s consider that prior to rolling out a tablet platform, forms need to be printed, handed out, and then carefully reviewed by a staff member, often a high demand nurse, to ensure they’re all filled in. Then, they pile them into a folder, and at the end of the day, another member of the team scans them, files them electronically, and then archives them physically. Utilizing tablets to complete forms eliminates the majority of the administrative work delivering operational efficiency. While calculations may vary based on the current health systems process, the net outcome is a reduction in required staff administrative work valued around $3/patient, and allows the provider to reallocate resources to value added tasks- like collections! POS Collections: The best way to increase collections is to present clear and easy methods of payment as frequently as you can. Healthcare needs to follow well-established consumer trends to present the patient with familiar payment interfaces. Where the tablets are integrated with the finance and billing systems, making a payment at the point-of-service is easy for both patients and staff. An enterprise platform will offer patients options to store payment information for an HSA account or credit card in the system. The tablet then becomes a 1-click payment option. If not, Apple Pay, encrypted chip and magnetic strip readers are an option like most consumers check out online today. Make sure your vendor is PCI compliant and utilizes hardware that does not transfer or store patient credit card information to reduce liability risk. As a health system with multiple revenue sources and merchant allocations, payment processing and financial reporting can be complex. Don’t add to your headache by introducing another manual entry point. An enterprise ready system is able to report payments directly back into the financial system of record and provide consolidated payment processing reports per department and revenue center. Value comes from a platform that can be configured to accept co-pays, estimated payments, and past due balances. In fact, by presenting patients with outstanding bills at the point of service, this increases the chances of collecting payment by 62 percent. For the consumer, this approach removes the transaction cost of having to think about finding the credit card or writing the check and moves more quickly off a patient’s to-do list. And finally, remember to look for a staff option to handle simple but critical functions like patient refunds and voids of transactions integrated into the platform keeping patients out of the financial office and extended co-pay battles that are costly and devastate patient satisfaction. Take out the Garbage (Cleaner Claims): The beauty of using a tablet at registration is that the patient can review and edit the basic demographic information their provider has on record in the EMR. And no one knows their information better than the patient. Because patient demographic information tends to be wrong over 30 percent of the time, the simple act of ensuring patient information on file is correct can reduce bad debt by over 4 percent. In addition, eliminating paperwork improves patient satisfaction by increasing control and staff morale by offloading the most tedious part of their job. Cleaner claims have delivered one national multi-facility healthcare system a 15 percent increase in staff efficiency. Verifying that the right insurance is on file increases clean claim rates by 22 percent. Automated eligibility checks also give patients and staff the important information on benefits coverage for an upcoming service. By presenting patients with this information before service, they can talk to their providers about their options and make better informed decisions about their care. Determining eligibility can also help healthcare organizations reduce claims denials and put the proper safeguards in place to ensure patients have the support structure they need. For example, a healthcare organization might provide financial assistance or payment plans for patients who cannot afford service. Caring for a patient’s financial health is part of caring for a patient’s overall wellbeing. Platform Integration: Removing paper from the equation by digitizing forms, healthcare systems are realizing immediate cost savings, relieving staff of manual tasks, and giving patients a faster registration process. But, perhaps what’s most compelling is what happens after the organization has adopted the user facing aspects of the technology platform and begins to focus on the back end automation, removing work from both the staff and the patient. Platforms that establish bi-directional data exchange with document management, scheduling, billing and EMR systems act as an overlay of operational automation to a potential HIT hodge-podge. Whether resulting from expanding, acquiring and evolving health systems, it is the reality that most systems will have a Big Name EMR, a separate scheduling solution, perhaps homegrown billing and a dated but solid documentation management. An enterprise patient check-in platform sits above these systems and pushes and pulls information to smooth over the gaps and retain a clear and common patient experience. Keep in mind that a self-service solution that extends across multiple EMR systems will eventually need to reconcile patient identities, i.e. MRNs. No one wants to require a patient to create new accounts for each hospital they patronize. Many health systems are implementing EMPIs (Enterprise Master Patient Identifier) to manage this challenge. A patient experience that includes recognizing appointments, bills and completed forms across markets or regions needs to integrate with an existing EMPI to provide a universal identifier, process merges for multiple records and expunges duplicates. Additionally, using the EMPI ensures patient data accuracy and consistency across the locations within the health system. Measure, Measure, Measure: Enterprise Registration Performance Management: Aside from conducting a manual time study, health systems typically have limited data about the time it takes to complete a manual check-in process, or data on wait times, staff, or throughput. Using a tablet technology platform, metrics are automatically collected each time a patient or staff uses the system- by location, department, clinic, financial status, demographic, time of day, day of the week and on and on. Self-service platforms and the systems they serve are realizing the value of this information to understand patient as a consumer behavior. Ensure administration and leadership has access to dashboard reports with aggregated metrics providing visibility to daily operations and long-term trends. Reporting tools quantifies trends that are usually the “gut feel” of revenue cycle managers and patient access directors. Operational reports that can support decisions on, for example, staff allocation depending on the varying volume trends by time of day or day of the week or incentives to offer to patients to encourage POS collections. When there are greater efficiencies, they’re felt by both administrators and patients. After implementing tablets for forms management, one hospital system took check-in from 12 minutes to 4. In other locations, this reduction in wait times has been attributed to a sharp increase in patient satisfaction. 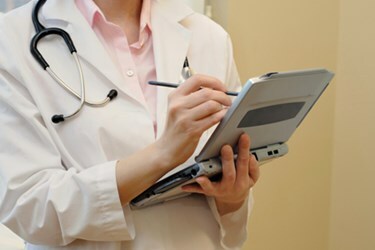 Build for the Health System: Mobile solutions such as tablets offer the ability to connect and offer a consistent digital experience across the entire patient experience. Removing paper opens the doors for major savings along the whole continuum across large and small health systems. The paper saving of health systems identified and discussed above was developed using a detailed methodology that was designed and successfully rolled out across the health system. As a result, the quantifiable savings demonstrated for a beta deployment can be applied across the health system. A 50-facility health system conservatively expects to save more than $50 million dollars over five years as a result of the tablet registration workflow improvements. Tablets also afford staff the opportunity to modify the digital workflow on the fly and gather appointment-specific information. Even the most basic question, “Are you here for a scheduled appointment or are you here as a walk-in?” can allow healthcare facilities to optimize their patient flow. Now, if you take it a step further and ask questions like, “What are your symptoms? What is your pain level? Have you traveled abroad recently?” healthcare facilities really have the opportunity to prioritize patients- correctly and discreetly. Dynamic electronic form design allows health systems to design the forms to meet the clinical requirements of the patient population improving operational efficiency and improving patient satisfaction. Understanding that required work on beta locations navigating integration and design challenges can and will in the months and years ahead deliver quantifiable ROI. Enterprise health systems with multiple instances on the same EMR vendors who have planned appropriately to map out effective delivery and implementation will realize the target operational efficiency goals. The healthcare industry is undergoing a radical transformation, powered by increasingly adamant customer expectations and a fundamental shift in payment and reimbursement structures. The transition from volume-based to value-based care will require more significant changes than just administration and billing, it will mean an entirely new paradigm for how healthcare is conceived, delivered and measured. Despite these challenges, it also presents an opportunity to refocus attention on the people served and work toward the health and wellness of our communities. The focus on operational efficiency and patient engagement fosters a comprehensive approach to engaging with empowered consumers as partners rather than recipients. Leading health systems have identified this predicament on their own as well and are investing in integrated tablet solutions that will drive operational efficiency and improved patient engagement. With a strategic application of value-add technologies, these healthcare systems can realize significant gains in mobility, ubiquity and immediacy in the short term while laying the groundwork for long-term growth. Deborah co-founded Vecna Technologies in 1998 with the goal of empowering humanity through transformative technologies. A recognized innovator, she has led her team in developing patient self-service, telepresence, and robotics solutions. Today, Deborah serves as the CEO for the Patient Solutions division of Vecna, with a primary focus on providing healthcare organizations with an integrated platform solution to remain competitive in a rapidly changing healthcare paradigm. The company’s platform gives patients and staff the tools to complete tasks across devices – whether online, onsite, or on the go. Deborah holds a master’s degree in Aerospace Engineering from the University of Maryland where she concentrated on robotics and human factors of space travel, including impact on human physiology and health maintenance. She also has a BS from MIT. She is mother to five active children and a SCUBA Master.